Thanks for visiting the demonstration site for Zap Calendar. Zap Calendar is an advanced, native Joomla calendar featuring AJAX, RSS, extensive iCalendar support, global time zone support and over thirty add-ons. Zap Calendar has been in active development for over 8 years. Choose one of the demo options above to see Zap Calendar in action. This is a live demonstration of Zap Calendar with actual events and showcases some of the available add-ons. 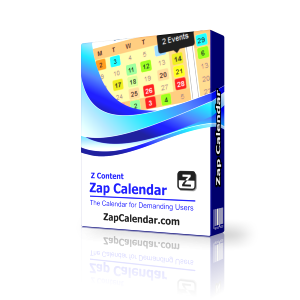 There are four versions of Zap Calendar available to fit everyone's budget. You can click here to find out more information on these versions and download information. 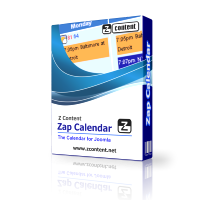 Additional information about Zap Calendar, including support documentation, can be found at ZContent.net, the developer of Zap Calendar. ←Clicking the event will provide more details and map where event takes place (directions too). 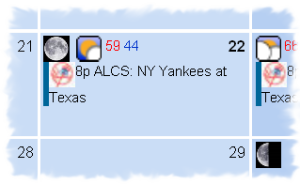 ↑New York Yankees and Texas Rangers are in the American League Championship Series. This event was automatically added to the calendar when the Yankees won the Division Series against Minnesota. After the game, the event will be automatically updated with the final score (ical sync plugin and Major League Baseball's ical feed).